The work is a collection of cameos using the D’Oliveira affair as a starting point and then recalling the impact of mainly South African cricketers through three key phases. The first comes alongside the Springboks isolation following the refusal to allow D’Oliveira to tour with England in 1968 and then to select their teams according to the principle of non-racialism. The colourful Tony Greig stamped his personality on the England side during the 1973/4 tour to the West Indies where he scored 148 in one innings and took twenty-four wickets. He will be forever remembered as the leading protagonist behind Kerry Packer’s World Series Cricket, rather than the first captain to win a series in India since Douglas Jardine in 1933/34 or the first all-rounder to take 3,000 runs and 100 wickets for England – only Ian Botham and Andrew Flintoff have matched him. Barry Richards came to England to play domestic cricket frustrated at the developments in his country. “After participating in the wining of a Test series”, he would write in Summers of Discontent, “every other cricket experience is an anticlimax”. Mike Proctor took 109 wickets for Gloucestershire in 1977, one of their most memorable seasons, and the following year won the award for the best-all-rounder. Another to win this prestigious accolade was the multi-faceted Clive Rice who led Nottinghamshire to two championships, and never fell below 1,000 runs for the season. Other county stalwarts include Ken McEwan who made valuable contributions to the all-conquering Essex side of the early 1980s and Derbyshire’s Peter Kirsten who bookended three double-centuries before the end of June in the 1980 season, with five centuries in July, 2002. Bowlers Garth Le Roux and Vincent van der Bijl would have enlightened an England line up that lacked bite and penetration. A second phase of influence saw players such as Alan Lamb, Robin and Chris Smith, and Graeme Hick make their commitment to the England team. Lamb captained the national side in 1990 when Graham Gooch had his hand broken by Ezra Mosley in the Caribbean, and scored a hundred in his first Test as leader. A batting average of 40 (Mike Gatting’s is 36) shows how important he was to England’s middle order. Robin Smith would triumph whilst those around him crumbled, notably his debut series against Australia in 1989, and would rise in the ICC’s batting rankings to number two. The third phase comes after South Africa’s readmission and acknowledges some of the great performances by international cricketers as overseas players. Alan Donald was an outstanding bowler and helped Warwickshire to dominate county cricket for a number of seasons. We might also forget that Zimbabwe’s Andrew Flower once topped the ICC’s batting ratings, whilst in his five seasons at Essex never scored less than 1,000 runs per year. 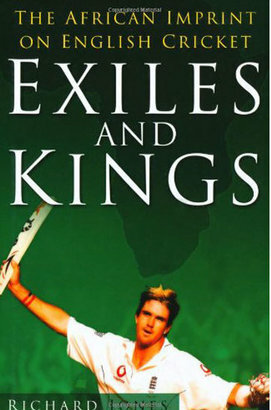 The book inevitably ends with the rise of Kevin Pietersen and examines his genius with reference to the 2005 Ashes series. It was published before Pietersen became captain, and comes full-circle linking D’Oliveira with Pietersen, notably the 158 they each scored against Australia. The work holds little for the social historian, offering nothing on the politics of South African cricket or the hardships faced by contemporary players. There is, therefore, no fourth phase about the increase in Kolpak players, professionals allowed to come to England to eke out a living income, and it ignores the contribution black cricketers made to the northern leagues in the 1970s. What is clear, though, is that England’s domestic cricket owes a debt of gratitude to the many players who graced these shores from Africa. Let’s hope that many continue to do so.